For all the colorful fishes that grab our attention, AMAZONAS readers surely know that gaudy appearances are only fin deep. 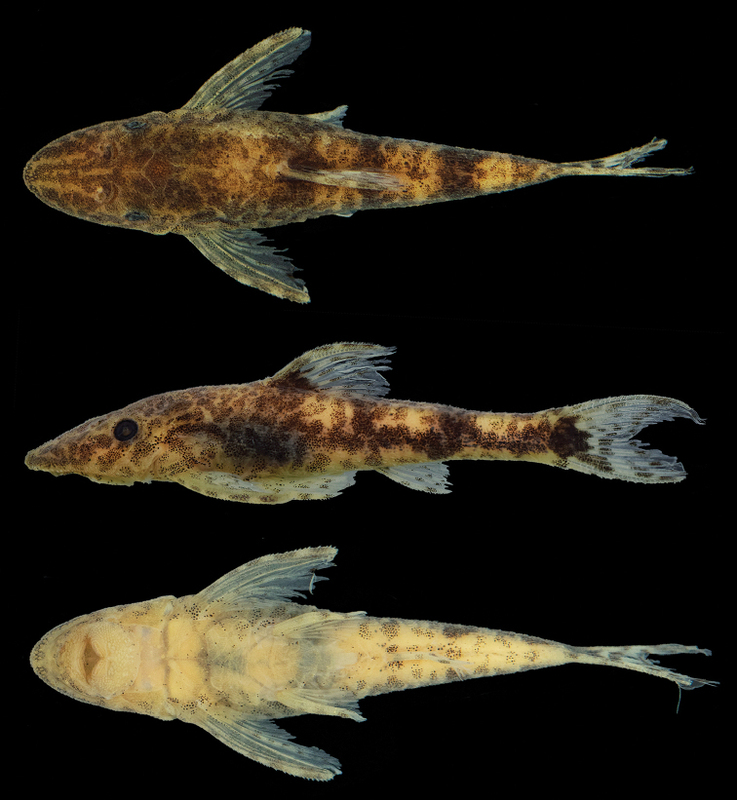 For the truest of fish geeks out there, we present a smorgasbord of unassumingly dull, yet nevertheless beautiful-on-the-inside new species descriptions that only the least superficial among us will get excited for! In honor of those die-hard ichthyologists who scour the planet in search of new life—even if it is drab brown—let us be the first to herald your accomplishments! Could we just encourage you, and the journals that publish your work, to also include photos of the live coloration (even if it does look more or less the same dead or alive)? Phallobrycon synarmacanthus; Brazil: Pará: Senador José Porfírio, rio Bacajaí; a, MZUSP 118815, holotype, 31.3 mm SL, adult male; b, MZUSP 118816, paratype, 30.1 mm SL, adult female. Photo credit: Netto-Ferreira et al. 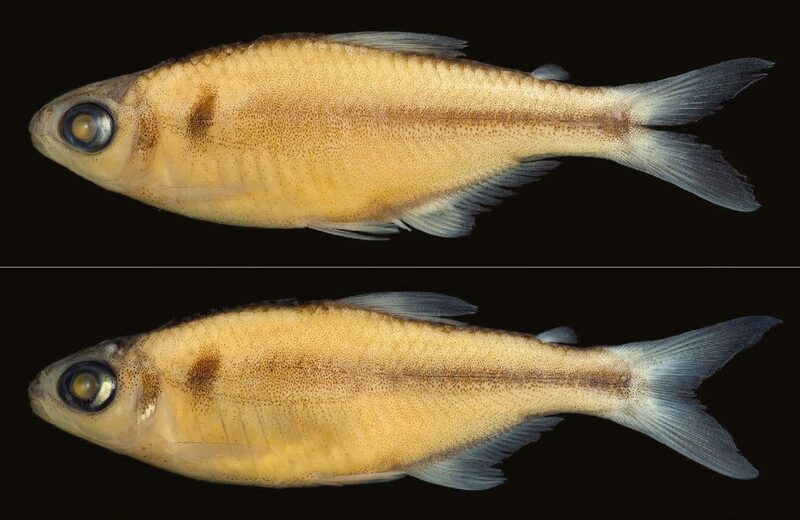 Andre L. Netto-Ferreira, Douglas A. Bastos, Leandro M. Sousa, and Naercio A. Menezes introduce this new species of tetra in the paper Phallobrycon synarmacanthus, a new species of Stevardiinae from the Xingu basin, Brazil (Teleostei: Characidae), published in the journal Ichthyological Exploration of Freshwaters, November 2016. Since the description doesn’t include any comments about live coloration, we’re guessing that when alive, this species is probably just a silvery gray with a nice black humeral spot. But we could be surprised. Read the full description here. Garra mini, holotype, DU 70001, 44.4 mm SL; Bangladesh: Shuvolong Falls. Photo Credit: Rahan et al. Looking slightly less dead than the tetra above, at least Garra mini has a cool-sounding, easy-to-remember name going for it. Discovered in three waterfalls from two river drainages in southeastern Bangladesh, and reaching sexual maturity at only 40 mm in length, the epithet mini seems well deserved. This is another little brown fish with a horizontal black stripe. 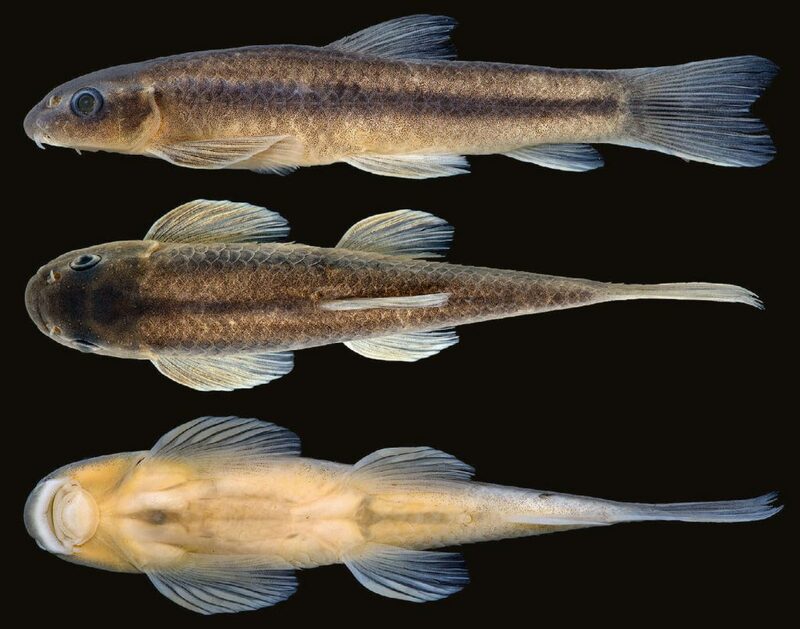 Garra mini, a new small species of rheophilic cyprinid fish (Teleostei: Cyprinidae) from southeastern hilly areas of Bangladesh, published in October 2016 in the journal Ichthyological Exploration of Freshwaters, by authors Md. Mizanur Rahman, Abdur Rob Mollah, Michael Norén, and Sven O. Kullander, can be read in full here. Parotocinclus dani, MZUSP 120737, 27.3 mm SL, holotype from small tributary of rio Peixoto de Azevedo, rio Tapajós basin, municipality of Peixoto de Azevedo, Mato Grosso State, Brazil. Photo credit: Roxo et al. You can see more images of this species, and learn about its sexually dimorphic characteristics (should you be oddly lucky enough to find this species swimming in your tanks, and you want to see if you could breed it), when you read the open-access article here. Which is your favorite of the new species noted above? Tell us in the comments below! Roxo FF, Silva GSC, Oliveira C. Description of a new species of Parotocinclus (Siluriformes, Hypoptopomatinae) from the rio Tapajós basin. ZooKeys. 2016;(634):125-136. doi:10.3897/zookeys.634.9917.